At Ohio State, the Department of Athletics’ training and competitive facilities are its classrooms, wherein talented student-athletes hone their skills and reach their potential. Coaches prepare student-athletes for competition and success as students, athletes and citizens. Teams focus on winning, but winning transcends the final score of any game or grade point average. Winning is about succeeding in life. A new master plan for the Athletic District has been created to build upon the stellar tradition of competitive success for which Ohio State has become widely recognized. The Athletic District will consolidate the vast majority of practice and competitive facilities into a contiguous space. Doing so will provide student-athletes and their coaches the optimal training and competitive environments. The Athletic District will be a win-win-win: for student-athletes, coaches, and for Ohio State. The Schumaker will provide a state-of-the-art facility for the nutritional, physical, and psychological development of student-athletes on 33 teams at Ohio State. Over 800 student-athletes will lift, condition, train, and rehabilitate injuries in the complex, while also benefiting from nutritional and mental preparation for peak performance. This new facility will be the training “hub” for 33 Olympic sport teams. 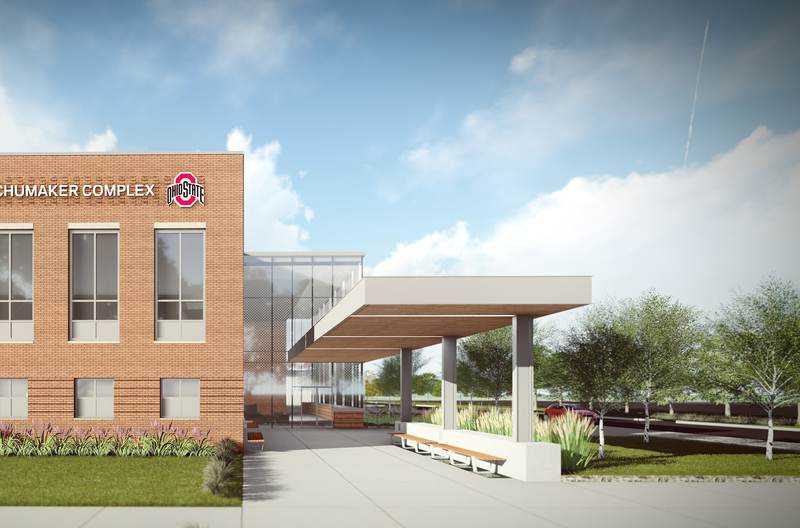 It will be located in the heart of the Athletic District and connected to the iconic Woody Hayes Athletic Center at the Les Wexner Football Complex. Strength and training facilities are used year-round by student-athletes to enhance their fitness levels and reach their potential. These facilities are classrooms linked to athletic success. By providing this greatly enhanced environment for collaboration, innovation and learning, Ohio State will attract an increased number of Olympic caliber student-athletes, as well as providing an optimal training facility for all the student-athletes already attending the Ohio State University.